as worrisome as the boll weevil that destroyed cotton harvests in the 1900s, except this one takes farmers’ land as well as crops. 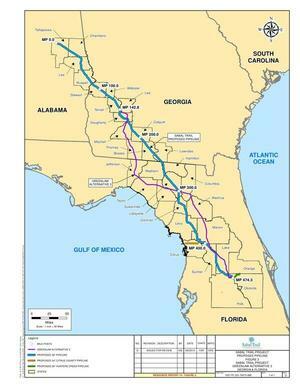 The 21st century invader is a 500-mile-long, 3-foot-diameter natural gas pipeline running from Alabama to central Florida that will cut a 159-mile-long, 100-foot-wide swath through at least nine Georgia counties, bringing with it the risk of contaminating the region’s well water and rivers and streams through leaks as well as noise and air pollution from a compressor station located in a densely populated area near Albany. The Sabal Trail underground pipeline will feed Florida Power & Light (FPL) electric generation facilities in central Florida, but studies show that the Sunshine State utility could generate the same amount of electricity with solar power while impacting half as much land. 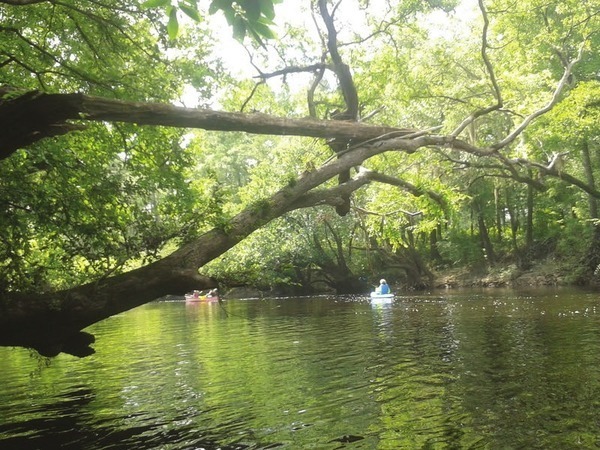 The Sabal Trail pipeline’s path across southwest Georgia would require boring underground pipelines beneath the Withlacoochee, Flint and Chattahoochee rivers as well as numerous smaller streams, and will course underground above the Floridan aquifer. 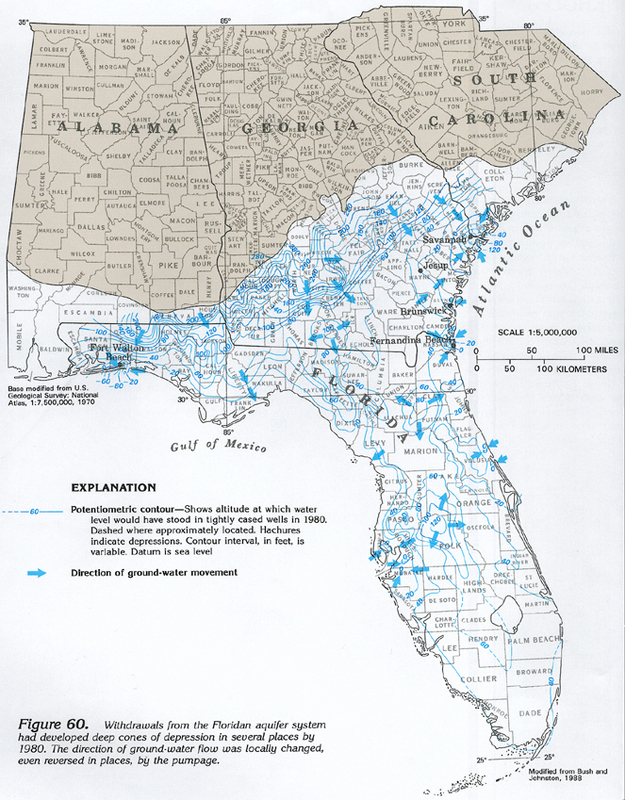 The Floridan aquifer is the region’s most important water source, providing more than 600 million gallons a day to irrigate crops, run industries and supply homes and businesses with drinking water. 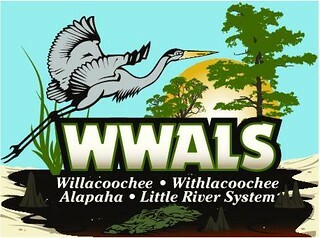 The currently proposed pipeline route runs through Stewart, Webster, Terrell, Lee, Dougherty, Mitchell, Colquitt, Lowndes and Brooks counties—a swath of land that is home to rare wildlife including the Georgia state reptile—the federally endangered gopher tortoise—along with the federally protected indigo snake and red cockaded woodpecker. 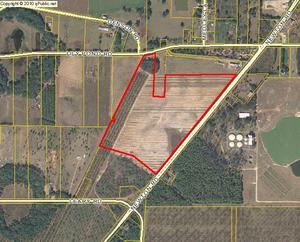 Other communities in the region may be impacted depending on the final route chosen. While the Sabal Trail pipeline’s parent companies, Spectra Energy and NextERA Energy would have residents believe their 3-foot-diameter pipe is a benign neighbor, the history of gas pipeline accidents and environmental ills paints a different picture. 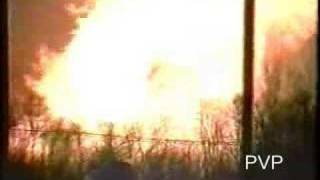 A 2011 pipeline explosion in Alabama incinerated 65 acres of forest, and a 1994 explosion at one of Spectra’s lines in New Jersey set fire to an apartment complex, injuring dozens and leaving hundreds homeless. 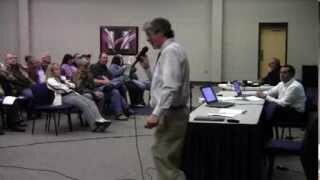 Given the karst geology of southwest Georgia, the dangers of an underground pipeline are especially profound. 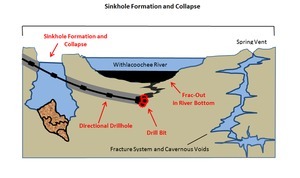 Sinkholes are increasingly common in the region and may cause pipeline leaks that could easily contaminate the underground aquifers that serve as the drinking water source for many rural residents. Meanwhile residents of Albany are particularly alarmed because a compressor station would be located near homes, churches and parks. Pipeline compression stations are a major source of noise pollution and also emit nitrogen oxides and volatile organic compounds that can cause respiratory problems. Though these dangers are real, the political cards seem stacked against residents of southwest Georgia. Spectra Energy earlier this year donated $10,000 to Gov. Nathan Deal’s election campaign, and Florida Gov. 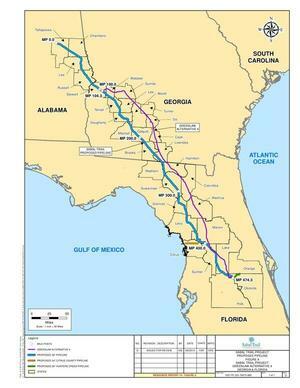 Rick Scott, also up for reelection, is an investor in the pipeline project. 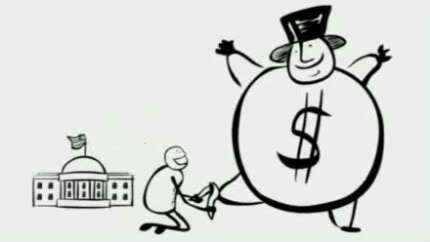 The Federal Energy Regulatory Commission (FERC) which is charged with approving the pipeline’s route through Georgia, is a federal agency that receives all of its funding from fees collected from the energy industry. 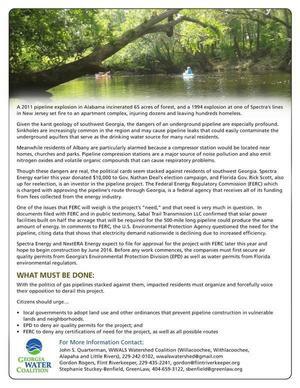 One of the issues that FERC will weigh is the project’s “need,” and that need is very much in question. 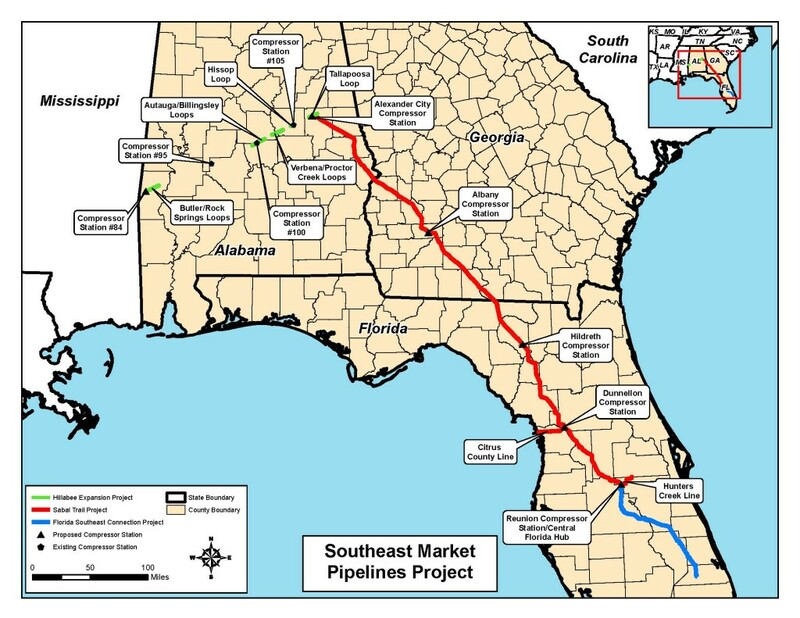 In documents filed with FERC and in public testimony, Sabal Trail Transmission LLC confirmed that solar power facilities built on half the acreage that will be required for the 500-mile long pipeline could produce the same amount of energy. 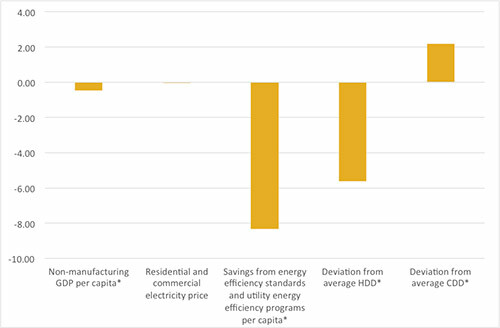 In comments to FERC, the U.S. Environmental Protection Agency questioned the need for the pipeline, citing data that shows that electricity demand nationwide is declining due to increased efficiency. Spectra Energy and NextERA Energy expect to file for approval for the project with FERC later this year and hope to begin construction by June 2016. Before any work commences, the companies must first secure air quality permits from Georgia’s Environmental Protection Division (EPD) as well as water permits from Florida environmental regulators. With the politics of gas pipelines stacked against them, impacted residents must organize and forcefully voice their opposition to derail this project. local governments to adopt land use and other ordinances that prevent pipeline construction in vulnerable lands and neighborhoods. 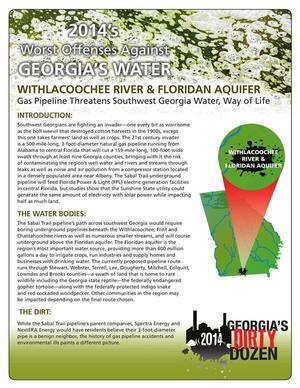 This entry was posted in Aquifer, History, Law, Maps, Pipeline, Politics, PR, Quality, Quantity, River and tagged Aquifer, Chattahoochee River, conservation, Dirty Dozen, Flint River, Florida, Floridan Aquifer, Georgia, Georgia Water Network, John S. Quarterman, Lowndes County, north, north Florida, pipeline, quality, Quantity, river, Sabal Trail Transmission, Santa Fe River, south Georgia, Spectra Energy, Suwanee River, watershed, Withlacoochee, WWALS, WWALS Watershed Coalition on October 22, 2014 by jsq.